1. 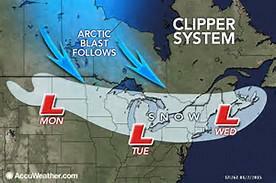 Do you know what an Alberta clipper is? 2. An Alberta clipper (also known as a Canadian Clipper) is a fast moving low pressure area which generally affects the central provinces of Canada and parts of the Upper Midwest and Great Lakes regions of the United States, precipitating a sudden temperature drop and sharp winds. Most clippers occur between December and February, but can also occur occasionally in November. Living in the Great Lakes state of Michigan, we were already receiving Lake Effect snow last night, which is usually several inches. An Alberta clipper passed over Lake Michigan West to East during the night. Do you know what happens when it crosses moisture? 3. It snows even harder! 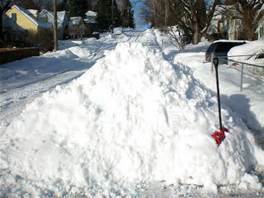 We woke up to school canceled and a Foot of snow in our driveway! Have you ever visited any of The Great Lakes? 4. 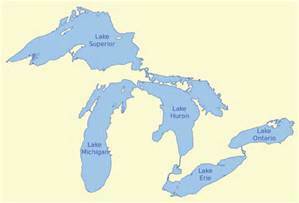 If you have ever visited any of The Great Lakes, which one(s)?